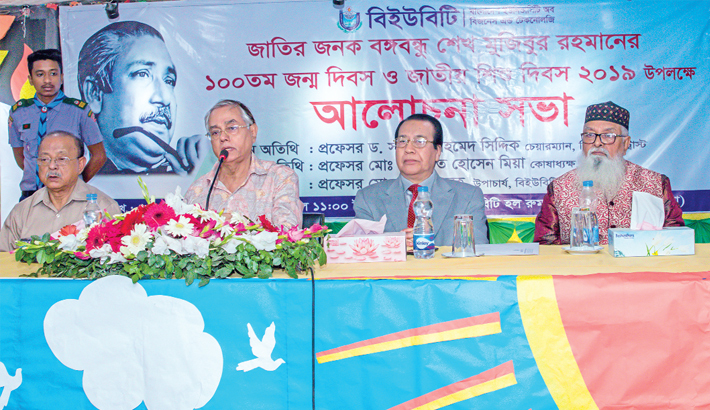 Bangladesh University of Business and Technology (BUBT) celebrated the 99th birth anniversary of Father of the Nation Bangabandhu Sheikh Mujibur Rahman and the National Children’s Day-2019 on its campus in the city on Monday. Prof Dr Shafiq Ahmed Siddique, Chairman of BUBT Trust, was present as the chief guest at a discussion meeting while Prof Md Abu Saleh, Vice Chancellor of BUBT, presided over the programme. Prof Md Enayet Hossain Miah, Treasurer of BUBT, and Prof Mian Lutfar Rahman, advisor of students’ affairs, spoke on the occasion.